Do You Have Hearing Loss and Tinnitus Linked to Defective Earplugs? Home » Recalls » Do You Have Hearing Loss and Tinnitus Linked to Defective Earplugs? If you or a loved one has suffered from hearing loss or tinnitus, you may be eligible for financial compensation. Eligibility requires military service between 2003 and 2015. Soldiers must’ve been issued earplugs during their service, but still found they had permanent damage from using them. 3M, a conglomerate organization sells products to the U.S. Military on a regular basis. One such product was the CAEv 2 Earplugs. 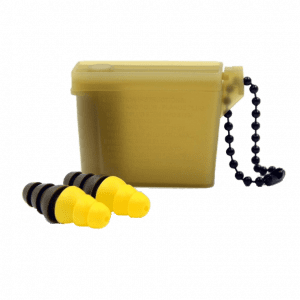 These earplugs were specially designed for soldiers stationed in Iraq and Afghanistan who were routinely exposed to loud noises like explosions or gunfire. They had a dual purpose of protecting the eardrum while allowing the wearer to experience a normal auditory response. Research has come out stating that the manufacturing of these earplugs was too short. The problem is this meant the device would loosen within the wearer’s ear. This issue made the earplugs completely useless and subjected wearers to the sounds they were trying to protect themselves from. The CAEv 2 Earplugs have changed ownership over the years from Aearo Technologies to 3M. Allegedly, both companies knew about the defective military earplugs as early as 2000. Their earplugs were a standard issue between 2003 and 2015. At the time, the U.S. Military was not aware of the fault. Since learning of the problem they have stopped giving them to their soldiers to protect their hearing. The surprising news is both companies were allegedly aware that the earplugs failed to pass a safety test. Back in 2018, 3M paid $9.1 million, though they stand true that they had no wrongdoing. The earplugs have since been discontinued. The unfortunate news is the use of these earplugs for service members means thousands of men and women are at risk for tinnitus and permanent hearing loss. Soldiers at war are exposed to loud noises. Auditory damage has been a long-standing problem for many veterans. The CAEv 2 was supposed to help reduce the chances of this happening. If you have hearing impairment from being in the military, seek professional assistance from a doctor. Then, call Bart Durham. Have You Suffered from an Illness Because of Roundup®? Have You Suffered Injuries While Using Talcum Powder? Have You Suffered Injuries While Using Xarelto? Have You Suffered Injuries Due to Defective Hip Replacements? We can help you determine what earplugs you were wearing, if you have a claim, and get you the compensation you deserve. Call our offices in Nashville at 615-242-9000 or Toll Free at 800-844-1712 to tell us about your case. Our law firm accepts cases on a contingency fee basis. We provide a free consultation and case evaluation. If we handle your case, you will not pay attorneys fees unless we are able to recover money damages in a settlement or trial award, if your case goes to court. Se habla Español.